Winter in California will always feel like spring to me, because it feels like spring in the Midwest—my home, the place whose rhythms beat in my chest no matter where I go. It’s not just because we go back to Michigan for the holidays and this is the very welcome weather we return to in January. It surely has something to do with the rain. But more than anything else, it’s an unnamed quality, something in the air, that fresh scent paired with the green grass and the warmth of the sun, all bundled up into something I can describe but never name. And spring in the Midwest feels like hope. Everyone who’s lived in a cold place knows what I mean. It’s the relief of winter ending, of the snow melting and the seasons turning and the sun reemerging, one more time, just as it always does right when you’re about to abandon hope. But if, perhaps, it comes in January rather than March or April, this sensation is compounded by the spirit of the new year. Intentions and resolutions and all of that hoopla—I love it unabashedly and unironically. The whole thing is cranked up a notch when it also feels like springtime to my soul. But this year, I spent much of January sick, with that nasty flu virus it seems everyone has, and I’m finally reemerging into the glorious world where there are such things as fresh citrus and sunlight and people, gosh darn it! I actually have the energy that one might apply, for example, to a renewed yoga practice! So I’m really leaning into the whole thing right now. Yet the feeling of spring in January feels like cheating, to be honest, even five-plus years into California living. I’ve not withstood nearly enough to get that boost of light and hope! My compatriots across the country are still digging cars out of snowbanks and bundling against the chill and paying those high heating bills and so much more, building that unmatched Midwestern resilience. I try to just be grateful, and channel all of the springtime vibes I can gather to those of you still in the dark of winter. 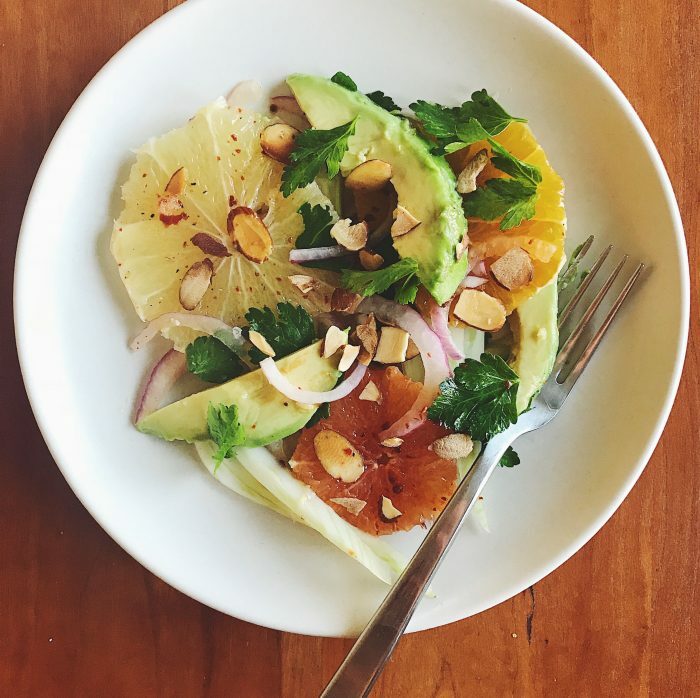 That winter is the season of citrus and avocados has always seemed so right to me. The vibrant oranges and reds and pinks and yellows of grapefruits and pomelos and oranges and tangerines, their brilliantly bright flavor, the comforting richness of avocado, the way its fat balances out all of that acid: this is my favorite winter combination. Sometimes I keep it at just those two ingredients, topped with good olive oil and flaky salt. 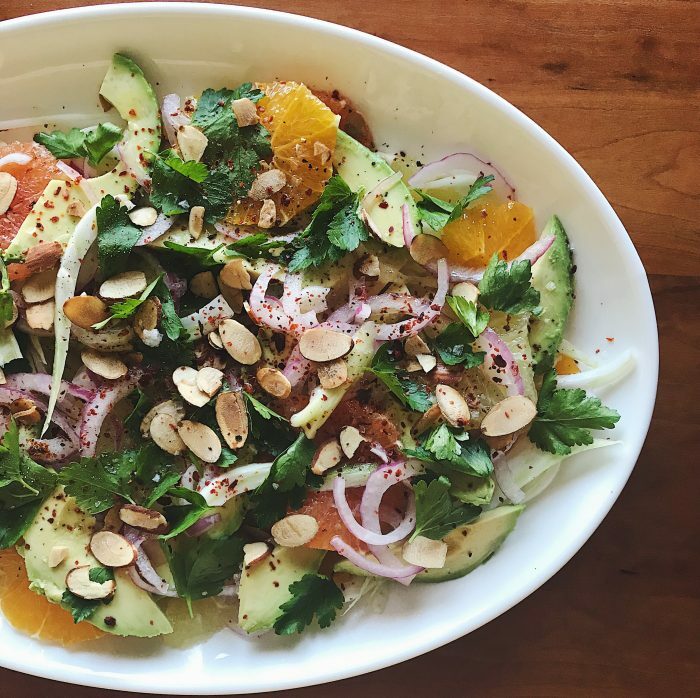 But more often, I expand the concept slightly to what follows, bulking up the salad with fennel and layering flavor with toasty nuts or seeds, the spice of pepper and barely pickled onion. This is a formula salad, the sort of thing that takes well to adjustments and improvisation. Leave something out, or follow your impulses to add another dimension. But regardless, let it brighten up your days, like sunshine, like hope, like the coming change of the seasons and perhaps even the reminder of home. Thinly slice the red onion or shallot. If using a red onion, first cut it in half, then slice it into half moons. Put the slices into a small bowl, then pour in enough vinegar to pool at the bottom of the bowl. Add a big pinch of salt, then massage the onion and vinegar. Leave to pickle slightly. Remove the fennel fronds if they’re still attached to the bulb, reserving some for garnish. Halve the fennel bulb lengthwise, remove the core and thinly slice lengthwise. A mandoline slicer works well here, though it’s not necessary. Peel and slice the citrus however you’d like. If you have time and the inclination, you can supreme them, but I usually don’t. Usually, I simply remove the peel and pith, then slice each fruit into rounds about 1/4 inch thick. Reserve the juices that pool on the cutting board, as best you can. Halve the avocado, then cut each half into slices. On a large platter, arrange the fennel, citrus and avocado. Sprinkle the onion or shallot slices over top. (If you don’t need all of them, save the leftovers in the refrigerator for up to a few days to liven up other salads and the like.) Drizzle generously with olive oil, the vinegar from pickling the onion and the reserved citrus juices. Sprinkle the nuts/seeds, parsley and pomegranate seeds, if using, over top. Use plenty of toppings, but also make sure to leave the salad below visible. Finish with the Aleppo pepper, if using, plenty of flaky sea salt and freshly cracked pepper. I live in the Northeast but am currently visiting my daughter in San Diego and havie been ordering versions of this salad wherever we go out to eat. The best I’ve had was at Juniper & Ivy where it was served with a luscious buratta. I will be dreaming about it forever. Thanks for sharing your take on a taste of spring. Glad you are feeling better. You’ve nailed this formula, Queen of Salads. My mouth is watering looking at this photo! I will buy avocados today. 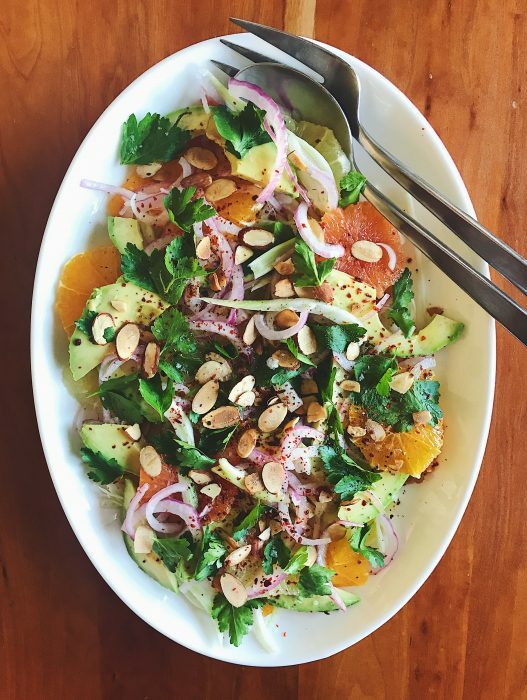 I love your salads,cara oranges are one of my favorites and all of the other ingredients too, going to do this one soon!